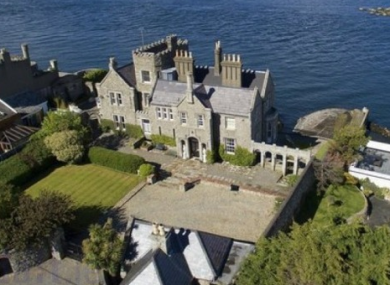 IF YOU HAVE ever taken a trip on the Dart to Killiney you will probably recognise this stunning Dalkey mansion. As you passed, you may have daydreamed about living there, wondering what it might look like inside. Well it’s up for sale – with an asking price of €10.5 million (yes, really) – so now you actually can have a peek inside. Inniscorrig was built around 1847 by a renowned Dublin physician called Dominic Corrigan. He was the first doctor to diagnose a heart condition known as Corrigan’s Pulse and the mansion was built as his summer retreat. You heard us; it wasn’t even his primary home. The spectacular house has its own private harbour and stunning sea views from the main living rooms. It has a large decked terrace outside and a boat house for hosting parties. There are four large bedrooms and a family bathroom on the first floor. The master bedroom also has its own bathroom and a dressing room. A fifth bedroom occupies the tower on the second floor. And all this for a mere €10.5 million. Well, we can dream, can’t we? Email “This iconic Dublin mansion will cost its next owner €10 million ”. Feedback on “This iconic Dublin mansion will cost its next owner €10 million ”.